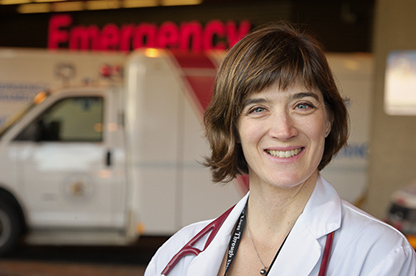 Corinne Hohl, MD, is an Associate Professor in UBC’s Department of Emergency Medicine and a Scientist at the Centre for Clinical Epidemiology and Evaluation. She practices Emergency Medicine at Vancouver General Hospital. Her main research interests are in patient safety, health systems innovations and drug safety and effectiveness. With her team, she has developed clinical interventions to improve the recognition and treatment of patients who are affected by adverse drug events in Emergency Departments and in acute care hospitals. She is presently working on improving adverse drug event case identification and reporting to improve clinical care, and is particularly interested in how adverse drug event reporting can be integrated into electronic medical records to improve patient safety, and leveraged to strengthen drug safety surveillance and research. For her work on adverse drug events, she was awarded a Best Paper Award from the American College of Emergency Physicians in 2011. In 2012, she was awarded with a New Investigator Award from the Canadian Institutes of Health Research. Corinne was the recipient of a 2016 Canadian Institutes of Health Research Foundation grant to continue her work on adverse drug event reporting, and is a member of the Canadian Drug Safety and Effectiveness Research Network.